Does waste pile up relatively quickly on the grounds of your property? If so, it’s imperative that you take control of commercial waste by recycling materials. 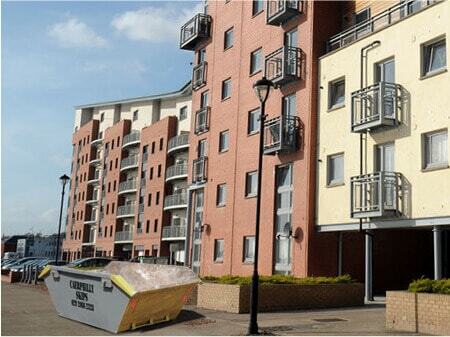 Caerphilly Skips operates in the South Wales area and provides skip hire for an affordable price. We are considered one of the best companies in Cardiff and the surrounding areas. Why, you ask? Well, it could be because of the fact we offer a wide choice of roll on roll off skips, or it could be because our containers range in size from 2-12 cubic yards! Whether you require long-term maintenance in South Wales or assistance with a building and recycling project, Caerphilly Skips guarantee to satisfy. We will arrange any on-road permits that are required and should you need to recycle heavier items, our team can deliver easy fill skips to your address. Don’t worry if you are struggling to get a permit, because with the Wait and Load service you can enjoy immediate container removal. What’s more, you could save up to £65. When you work with us you can choose from our range of mini skips, builder’s skips, maxi skips and roll on roll off skips. 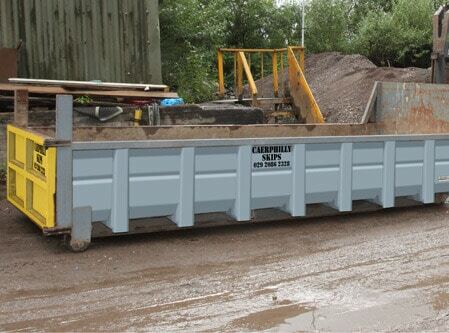 The enclosed skips are preferred by people working for the building trade, because waste cannot escape from these sturdy containers, which suppress dust. Most orders come with next day delivery and we can assist with both short term and long term jobs. You can book waste management services online or by calling us directly, so don’t hesitate!